Tattoos for the Blind is an art project created by Klara Jirkova, a student at the University of Arts Berlin. The idea is that implantable beads placed just under the skin could form readable braille characters. If braille tattoos were implemented, the technology would present blind people with a way to have a meaningful body modification. ...implants creating embossed text in braille placed under skin, can be read by touch - stroke by blind people. it could be either a small slide with embossed text in braille or bead-style implants (in this case the size of the beads must be a bit bigger than the standardized size of braille text. too small beads will sink in the muscles and they will not be embossed). alternative - transdermal implants, placed partially below and partially above the skin... (Klara Jirkova). As soon as I saw this project, I thought immediately of African scarification. The modification is accomplished by cutting or puncturing the skin; soot can be used as a sterile irritant to make the scarring more prominent. 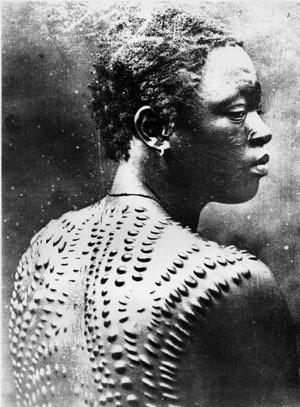 African scarification also conveys information regarding the cultural and religious beliefs of the wearer. Among some African peoples, a person does not truly join the community without this communication. Via Wired and Klara Jirkova; read more about scarification.